October 23, 2018, 10:53 PM · If you are doing something that is causing you pain, "Don't do that!" 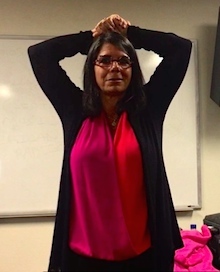 That was one important message from violinist and Curtis-based pedagogue Pamela Frank and New York-based physical therapist Howard Nelson at a wellness workshop they conducted last month at the University of Southern California's Thornton School of Music called Fit as a Fiddle. These days the two of them are giving presentations on performance injury treatment and prevention at music schools and conservatories all over the United States, and they have current residencies at USC, Oberlin and Curtis. USC Thornton actually has an entire program devoted to the Musician's Health and Wellness. For Frank this is all quite personal -- in 2012 she had a career-threatening injury that was causing severe pain in her neck and numbness in her hand, shutting down her ability to play. Doctors told her she needed neck fusion surgery; instead, she went to Howard Nelson for a physical therapy evaluation and treatment. Two years later, she was completely back to playing. And to give it a storybook ending, Frank and Nelson got married! Frank's "happy ending" notwithstanding, recovering from performance injury is not a straightforward process that concludes as soon as the muscles have healed and the pain has subsided. Rather, Frank and Nelson present injury prevention as a way of life, involving specific measures as well as constant attention to regular habits that could lead to problems. 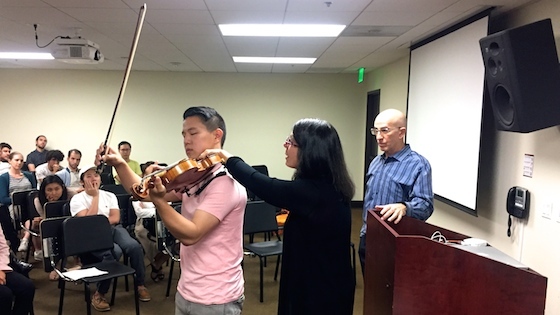 Violinist Pamela Frank and physical therapist Howard Nelson analyze the playing position of violist Kevin Hsu at a USC wellness workshop. One major way to help yourself, they said, is to identify any motions that you do all day long, whether they involve playing the violin or simply sitting at a computer screen, that produce even mild symptoms. "How you use your body all day can help or hurt you," Nelson said. "Your body adapts to how you use it." Nelson showed pictures of people subjecting their bodies to obvious contortion in real-life situations: slouching over cell phones and computer screens, twisting their legs and sitting diagonally on a park bench, even just lying sideways and holding up their head with one hand to watch T.V. When it comes to playing, it is helpful to notice: Are your feet flat on the floor, heels down? They should be -- and you may need to find a special chair or a $5 lift for your feet to make that happen. "If you are too tall, stack the chairs," Frank said. Are you straining your spine, by either arching it backward or collapsing forward? Are you tilting to the left at the waist? Are you raising your left shoulder to secure the instrument? Is your bow arm too high, i.e. higher than your shoulder? Is your head bent to the side or forward? Is it locked? Nelson's introduction to physical therapy came when he was injured himself. He is not a violinist, but a tennis player. Nelson worked his shoulder into such as state that one day he found that he could not toss a ball in the air to serve it. The problem? He was letting his upper arm come out of the socket when rotating his arm. The arm's ball-and-socket joint at the shoulder does not function well when the upper arm moves forward from the socket -- this causes strain. And yet, it's something that many violinists do with their bow arms: if you are bowing with your elbow above your shoulder, you are creating strain on that joint. It's easy to miss this kind of problem, because if you've learned to play this way, you won't notice it as a problem. "People do what is familiar, not what is beneficial," Frank said. This might be one of the reasons why Frank was extremely skeptical, in the beginning, about Nelson's therapeutical approach to her problems. While she was facing an injury so dire that it threatened her career, he was starting with seemingly mundane measures: putting pillows under her arms; trying to correct her head position from being to far forward when she sat in a chair or walked across a room. Given these seemingly simple measures, she said that was ready to ask for a refund. "We are expecting to have someone do something to us," Frank said. What she discovered, with time and patience, was that "a small adjustment can make a big difference." For example: that business about her head being too far forward. Try this exercise: sit in a slouched-over position, and then try turning your head. Now sit up straight and try turning your head. It's not hard to discern that "the joints of your neck align better when you are in an upright position," Nelson said. Frank had been dipping her left shoulder forward for so long that she had a hard time even facing straight-forward. Her left shoulder would drop down, even when she walked across the room. Now Frank can acknowledge that in many ways, re-learning how to walk in a different way helped her even more than fixing anything directly with the violin. But of course, changing the way she played was an essential part of the equation as well. To that end, they watched videos of her playing. "If you are ever going to evaluate body mechanics, you have to turn off the sound," Frank said. Ironically, her playing sounded good, despite the fact that her movements were strained and she could not feel her left side, she said. "You should not play with pain, tingling or numbness," she said. "As soon as you feel something, you should pay attention and do something about it." The changes Frank had to make were profound. "I basically had to change my personality to recover from this injury," Frank said. They analyzed absolutely everything: when she put on a T-shirt in the morning, she would throw her head forward. She had to learn to keep her head "in neutral" while putting on a shirt. "Everything became an arm exercise -- stop moving the head!" To this day, Frank frequently stands with her hands on her head, a strategy for keeping her posture and muscles in balance. When she was injured, she was actually unable to raise her arms over her shoulders - it took her months to recover that motion. Another activity to analyze: sleeping. We spend a third of our lives doing it. "That's a long time to be in a bad position," Frank said. The head and the spine need to stay in neutral during sleep. If you awaken each morning with soreness or pain, it's time to analyze your body position, when you sleep. Frank said that she always used to sit on the front of her chair, back arched, thinking that this was a position that showed alertness. "I had to learn to sit in the back of the chair, with my feet on the ground," she said. Also, one should not have to stoop to see the music stand, even if when playing chamber music. The stand should be positioned high, not low. Your spine has curves, and "if you violate those curves for a long period of time, you will suffer," she said. "You want to respect those curves." For Frank,, learning and living with good body alignment has meant that she never "needs" a massage any more, she no longer gets headaches and any tingling has gone away. But changing so many habits was not easy, and at first it felt bad. She had to remember what she always tells her students, "The way you play is the way you practice." The same goes for how you use your body. "You can't expect to feel good at the end of the day, when you've done stupid things to you body all day." When Frank and Nelson work with students, one major thing they address is something that they also had to address with Frank: customizing the violin, viola or other instrument to meet your body, so that your joints can be in a neutral alignment. "You should look like yourself when you play," Nelson said, "have the instrument meet you." One of the first questions that Nelson asked Frank was, "Is that the only height of chinrest that exists?" "We settle for what we have been given or what we have been told," Frank said. Of course, there are many kinds of chinrests; what ultimately worked for her was the adjustable SAS chinrest, which comes with three possible heights. Of course, as soon as they found the right set up, which allowed Frank to keep her spine straight, not to thrust her head forward, etc. etc. -- actually playing this way felt terrible, she said. It was not what she was used to, and it took great effort to adjust. "If it feels 'good,' then you aren't doing anything new," Frank said. "You have to leave your ego at the door." One thing she stopped doing was turning her head to look at her left hand. "Many of us stare at the left hand," she said, but there is no need to do so. "Playing is by feeling and hearing; you're not doing anything by looking. A lot of it is about trust." Learning the ergonomically "right" way to play is a slow process, and "under pressure and stress, you tend go back to what you know and what is familiar." You know that you've really made the change if, even under pressure, you can keep to your newer, better habits. "You need to divorce your body from your music-making," Frank said. "I've had to learn to separate the two things." But how do you make the music exciting, while also keeping your own emotions, passion and excitement in check? Musical excitement is created with musical means: rhythm, timing, sound, bow speed, internal dynamics. A good movement pattern can both minimize injury while also actually improving your performance. Let yourself make mistakes, especially during practice. Insisting on constant "perfection" can cause physical tension. Stop every 20 minutes and rest for one minute. Use a timer to make sure you do it. Get the lightest case you can, and "your music pocket is not a storage locker!" Frank said. Only carry around the music you need. If you are carrying your instrument and stop to talk with someone, put it down. Video yourself to see what you are doing, physically. Turn off the sound when you watch, to analyze movement. It's the accumulation of small measures and actions that can make a big difference in staying well and preventing injury, Frank said. As part of their residency at USC (and elsewhere), Frank and Nelson are also helping players individually: analyzing their movement patterns and recommending changes to both their playing and their other daily movements, to help them prevent injury or address any injuries they already have. The website for Frank and Nelson is www.fitasafiddle.nyc. October 24, 2018 at 08:12 AM · Violinists grow up with chin and shoulder rests that dont often fit them and usually no one tries to play without a shoulder rest as a child. Maybe that is why many dont notice that their setup is wrong for their body? And it is really hard to find alternatives for small violins. Im from Europe and I had to order the current chinrest from the States for my girls violin as the standard chinrest was uncomfortable for her. Im a GP with quite a lot of knowledge in ergonometry and Im so sorry every time I see that the violin setup is not beneficial for a childs body. The general notion seems to be that the child should fit the violin and not the other way around Im sad to say. October 24, 2018 at 05:24 PM · I love this post. October 24, 2018 at 05:50 PM · This is a great post and very timely for me as I have recently restarted lessons after a few years away from them. What Pamela said about having to pay attention to how she did things away from the violin resonated with me: while working on how I use my bowing shoulder, I noticed that when I brush my teeth, I move that shoulder vigorously. Totally unnecessary! October 24, 2018 at 05:52 PM · @ Francesca - perhaps we should practice using a proper bow hold when brushing as well? October 24, 2018 at 07:52 PM · Wow, it is great that Pamela Frank is back! I heard about her injury many years ago. Pamela Frank and I were in the violin section of the Youth Symphony of New York. I sat directly behind her for two years! October 24, 2018 at 11:29 PM · Great article! I absolutely agree with everything! Healthy movement patterns and good technique and musicality go together, so I really think more music teachers should work on these sorts of body and movement awareness skills with their students. I really think that if more people focus on the things said in this article, injury rates should decrease. In addition, I think more teachers should be aware of how technique varies among individuals due to differences in body types and schools of thought. My violin teacher has observed many performances over the years and she has noticed quite a few differences among players with different body types. It's actually quite surprising how much technique varies among players. Of course I'm talking relatively small details here. The rough principles remain mostly the same for everyone. October 25, 2018 at 04:04 AM · Matt, those are wise words! October 25, 2018 at 07:04 PM · As someone who has played the violin for 30+ years, I had no idea how my body grew around my violin playing. One of the first things I learned as a young student was to put my left foot forward and my right foot sideways and back. I started dealing with hip issues about 10 years after that because I would always stand that way. I have dealt with those issues until 2 years ago when my Pilates instructor started correcting this and after reflection, I realized it was a manifestation of my violin playing. I don't really have advice on an alternative stance, believe me I've tried, but to have that awareness has made all of the difference for me and I hope it can help someone else. Hip problems are now a thing of the past for me. October 28, 2018 at 06:20 AM · I feel that many young players are put onto instruments which are too big for them.